When I first started nurturing my love for writing I struggled to find my voice within my work. I had this misconception that there was a certain way a "writer" is supposed sound. I thought writers had to use big words, be totally unbiased yet somewhat humorous, and be the ultimate authority on their topic. This may be true in a sense, but ultimately a writer must sound like herself. 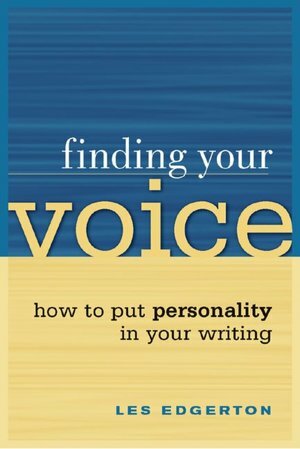 Les Edgerton the author of Finding Your Voice: How to Put Personality in Your Writing says: "Don’t write to impress, fellow scribes. Write to connect with your readers. Your writer’s voice builds a better bridge to your readers. It’s your fingerprint, it’s your individual writing style, and it gives your writing soul". Edgarton's advice spoke volumes to me. For one thing, it made writing much less daunting. Trying so hard to sound like someone else made me less confident in my work because I never felt like I was getting it right. Gratefully, one of my mentors brought to my attention that my writing had great potential, but she could not identify my voice. She told me the more my writing sounded like me the more my reader could grow to love my work. I realized that I wanted my readers to pick up one of my pieces and instantly say, this sounds like Donnice without even looking at my byline. Your voice is what builds your brand. Your voice is what makes your readers fall in love--or not--with your work. In my work, you will hear a goofy, sarcastic, passionate young lady who is hungry for a prosperous future without any reservation--that's my voice. What's your voice? As Nana's intern I have the opportunity to draft pitches of possible articles I may want to write about. I go on different websites such as nymag.com, thegrio.com, and fashionista.com to name a few and I read the day's stories so that my pitches can be relevant. The different writing styles and how the writers choose facts to support their work is very interesting, and sometimes even funny (the comments that readers leave are even funnier). Nonetheless, I've learned that in order for the writers to have a successful article or post they need a solid argument and solid proof. When I intially started writing my pitches I would look at different articles, form my opinion and go from there. I thought that an interesting point of view would grab my readers and make a great article. To my surprise I was wrong. Sort of. Yes, readers want an interesting read, however, you have to get the facts right to make a convincing argument. I recently read an article on nymag.com about how Carmelo Anthony "maneuvered the system to get exactly the coach he wants," leaving the Knicks "doomed" according to the writer. This was a very controversial topic for me because 1)I am very defensive when people speak of my team's future (#TeamKnicks), and 2)where does the author get off thinking that Carmelo has "maneuvered the system"? But after I read the article, I must say the author puts his facts together so well that he had me second-guessing Carmelo's intentions. The article started off with the stats on former Knicks Lakers coach Phil Jackson and how he has taken many teams to victory. It also stated that the last time he considered being a coach for the Knicks was in 1999! Supposedly after each season the Knicks have been crying out for Jackson's help. And to their relief he is now considering the offer. But here's the kicker--the Knicks' previous coach Mike D'Antoni resigned and Mike Woodson took his place. Why did D'Antoni resign? He resigned because, after working with Carmelo, he decided he would rather work anywhere else in the world than with that team. That was fine for Carmelo because he liked Woodson and worked harder under his coaching, and with Carmelo being one of the top players on the Knicks his efforts are needed for the team to succeed. However, the Knicks did not make it past the first round in the playoffs. Woodson got the team far, but Jackson might have gotten them the win. Yet, because Carmelo "likes" Woodson he may be staying which can possibly lead the team to another loss :(. Clearly the author of this article did his research!!! He had so many valid facts that could support his position. Had he just said Carmelo "maneuvered the system" without any support his article would have been ripped to pieces (by me). But because of his research I could clearly see his point of view and understand why he would feel that way. The time he put into researching and building his case is what made the article successful (to me). He knew that people would be opposed to his view so he carefully laid down the facts so that he could be understood. I now understand the importance of research. In my previous post I stated "passion is key"; well once you have identified your passion, I know now you have to be prepared to do much research to back it up. The "Ammazing" Amma Interviewed Me for Her Video Series! Writer / director Amma Bonsu trooped out to my apartment to shoot me for her online talk show "Ammazing Series" and it was an--wait for it--"ammazing" experience! Amma is a total pro and hoot to boot. Watch and chuckle for yourself. Many thanks to Amma and Mr. FK Poku himself who connected us. PS - check out Amma's site--and her interview with Maya Angelou!